Milk and milk products, honey, nuts and dry fruits are considered pure for the purpose and the panchamrit is made using all such ingredients, including Tulsi leaves h(Holy Basil). Tulsi is considered God's presence on the Earth as my grandmother used to tell, with so many medicinal properties we better see such plants as God I believe. 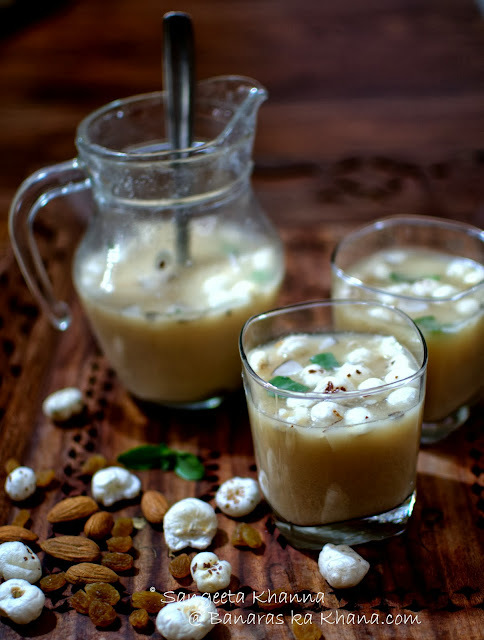 Panchamrit has a pleasant whiff of tulsi leaves, sweetness from milk and honey and a few nutty tidbits that make it an interesting drink to be had in sips and spoonfuls. It is served in small bowls or shallow glasses often made of terracotta or silver both considered pure for Godly purposes. But the most preferred way to serve Panchamrit for large crowds is to pour a big spoonful of this elixir into the cupped hands of devotees. 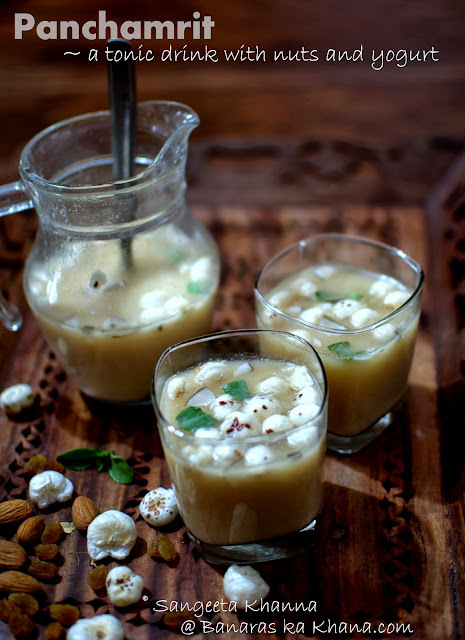 In temples this panchamrit is often a simpler recipe with just milk and honey (or sugar) and a handful of torn tulsi leaves, tulsi being the principle flavor lingering around that meagre sip. We have been making panchamrit as a drink any time even if we don't perform any religious rituals, just because we have loved the way it tastes and makes one refreshed within a few sips. The recipe is simple like most temple foods, all the ingredients are always found at home and stirring up sweetness is easy. Note that most families have their own versions of panchamrit with minor variations in this recipe. Mix everything together and let the mixture stand in a pitcher for about 30 minutes. This time allows the aroma of tulsi leaves infuse into the panchamrit and for the honey to dissolve well into it. Serve in small cups or glasses and feel the blessing of the Gods. The plant Gods I mean. Herbs and aromatic plants are actually capable to make one feel grateful for the bounty of nature. Tulsi is one such herb I love since my childhood, the aroma clung to me more than the rituals woven around the tulsi and anything that had that whiff of tulsi was a soul food..
Panchamrit is one such soul food that I crave sometimes. Try it and tell me if panchamrit touches your soul as well. Cheers!!! Hi Sangeeta! AMAZING recipe you've shared! I have a doubt though, the yogurt and milk together, is it safe to consume? because ayurveda considers them as virodhi aahar. Also, what should be the ideal serving size for this? I know about the milk and yogurt bit as per Aurveda but for the puja rituals this recipe has been considered kosher. It could be the whole combination that works together. Thanks for the prompt n apt response! I made it today and it turned out to be a true relish! Such soul satisfying foods! And you, the master of amazing recipes! Loads of love! And thanks! Keep up the good work!